Riverside Jet Center is located on the west side of the R.L. Jones Jr. airport. Arriving on South Elwood Avenue, turn into the airport and then left (north) on Airport way. Piper Drive will be the second road on the right. Riverside Jet Center is located at the end of Piper Drive. Riverside Jet Center is located next to the A1 and A2 taxiways, west of runway 1L/19R. Riverside Jet Center’s ARINC frequency is 130.30. 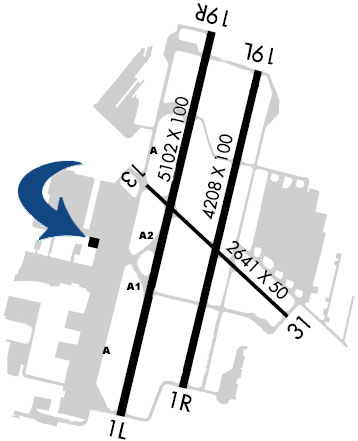 Printable letter size airport diagrams are available for download by clicking here and kneeboard size airport diagrams are available by clicking here.